As a teenage boy, I read a book by Earnest Hemingway, titled ‘The Snows of Kilimanjaro’. Since then this mountain has always fascinated me, and as a geology student studying the volcanic rocks of the African Rift valley, I revisited that fascination in my mind. This colossal cone of rock, rising from the hot African plain, and topped with glaciers and snow; one of the seven summits, the highest point on the continent of Africa, is a wonderful mountain and a challenge attainable by anyone with determination. 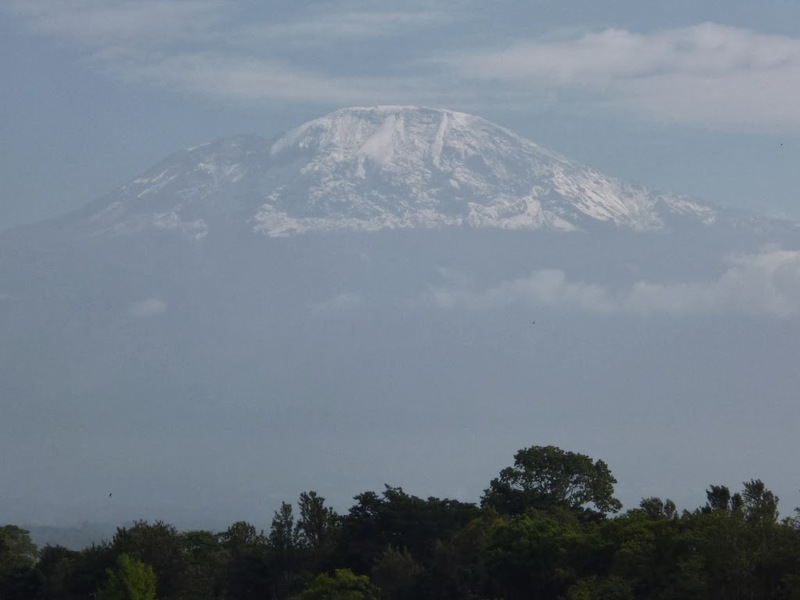 Kilimanjaro, 5895 metres high, seen from the Moshi road. It must be over 12 months ago now, that my friend and work colleague at the time, Mostafa Salameh, asked me if I would be interested in joining him as an assistant guide on a charity climb of Kilimanjaro. The charity concerned was the King Hussein Cancer Centre and Foundation in Amman, Jordan, a hospital that specialises in the treatment of people with cancer from across the Middle East. I was delighted to be able to help, both to give my time for such a worthy cause, and to finally take a close look at this magnificent mountain. And so I found myself at the beginning of February on a plane to Doha to meet with Mostafa and the 25 Jordanians who were taking on this challenge. My flight was late, and gave little time for introductions before we were again in the air, and this time bound for Tanzania and Kilimanjaro International airport. From there we were transferred to our accommodation for the first night, the Ameg Lodge in Moshi, where there was time for a leisurely meal and time to get acquainted with my adventurous travelling companions. The Ameg Lodge was a series of bungalows, set in well kept gardens, and with an accompanying bar and restaurant. A pleasant start to our trip. The next morning we bustled into our vehicles for the 2 hour drive to Londorosi Park Gate, where we were required to sign in with the park rangers. From there we headed to Lemosho Glades, our start point at 2100 metres, (6900ft). The journey was slow, on rapidly deteriorating mud tracks, finally we left our vehicles, ate a hasty lunch, and set off on the climb through the rain forest that now surrounded us. We were headed for the overnight stop at Mti Mkubwa (big tree), campsite, for some of our group the first night they had ever slept in a tent. It had started to rain, the beginning of the unseasonal damp and cool weather that was to be a feature of our eight days on the mountain, and the heavily used campsite soon became muddy. We assembled in our large domed dining tents, drank tea, and chatted excitedly about the challenges ahead. Black and white colobus monkeys in the rain forest zone. 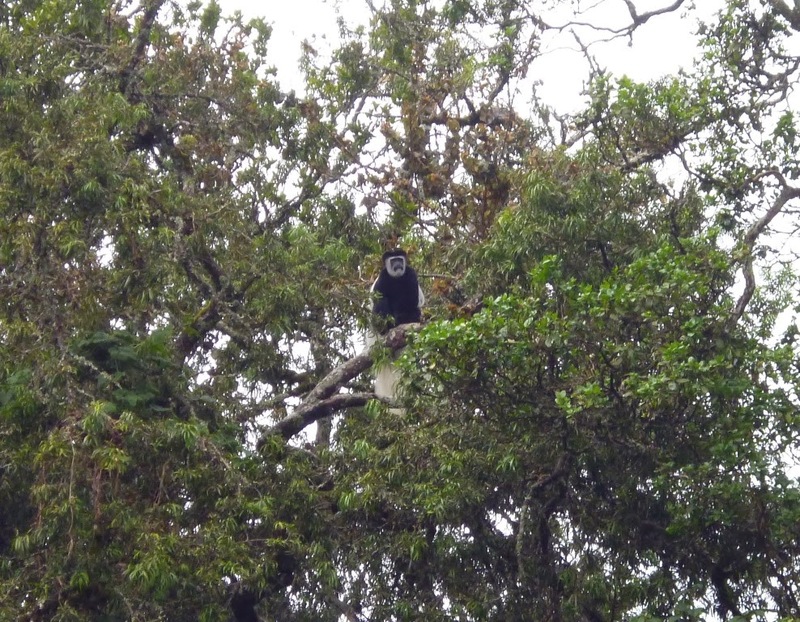 The next day we started out early, and still moving through the rain forest zone, soon encountered a resident of these parts, the Black-and-White Colobus monkeys. They were quite illusive, only giving themselves away by the heavy movement of branches in the trees. We occasionally got a glimpse of one, silently staring down at us from the safety of their lofty perch. By lunchtime we were out of the trees and in the moorland zone. At this altitude the flora consists almost entirely of tall, woody tree heather, a large straggly shrub with small white flowers. On leeward slopes, out of the wind, it can reach well over 2 metres in height. The steep path we had been following levelled out as we made our way across the Shira plateau, and headed for Shira 1 Camp, our home for the night. The following day was a short one, we reached Shira 2 Camp by lunchtime, and had the afternoon to rest and acclimatise to our new altitude. We were at 3800m (12630ft.). In the late afternoon I took off for a short walk up the mountain, the ground here was rocky, vegetation more sparse, and the skyline dominated by the crisp white outline of Kibo, the highest of the three volcanic centres that make up Kilimanjaro. Behind our campsite was Shira Cathedral, the smaller of the three, the other being Mawenzi, a peak we could not see from this side of the mountain. It snowed overnight, and lay as a pure white blanket over the mountain. We were headed for the Lava Tower, a prominent jutting pile of volcanic rock at 4800m, from here we would descend to the Barranco Campsite at 3940 metres, thus giving us valuable acclimatisation time. Just before the Lava Tower we lost the first of our colleagues, the first of six who would not make the summit; succumbing to Acute Mountain Sickness (AMS), he was given oxygen and escorted back to Shira 2 for evacuation, summit bid over. We were now hiking through the alpine zone, an arid and cold landscape, desert like and with little vegetation. However, we found it blanketed with snow, not normal and an unusual sight at this altitude. It is here that we saw the amazing Giant Groundsels, plants that have adapted to this harsh environment by using dead foliage to insulate the stems against the cold and desiccating winds, and by storing water within their fleshy leaves and trunk. The particular adaptations of plants, isolated on high peaks like Kilimanjaro, Mount Kenya and Mount Meru means each species is unique to its environment. These Kilimanjaro Giant Groundsels are found nowhere else on earth, and indeed there are many other plants for which this is the case, forever isolated on this alpine island of ice and snow, amid a sea of hot African savanna. The low lying snow, and yesterdays sun, had caught many of the porters unaware, by morning they were queuing for anaesthetic eye drops to treat snow blindness. This is sunburn of the retina, and can easily be avoided by wearing sun glasses, but most of the porters did not have sun glasses. It was a sad sight, and a salutary lesson. Thankfully they were all much better in a few days. From Barranco campsite we would move up to our penultimate stop before the summit, but first we had to negotiate the Barranco Wall, a rocky scramble of a few hundred metres. The morning was wet, persistent light rain fell in the grey early light, making a relatively straightforward route somewhat more challenging as the rock, well polished from hundreds of booted feet, became slippery and challenging for the unwary. One or two of the party were nervous of the climb, and the precipitous drop from the rocky ledges, but reassurance from our African guides and our steadying hands, ensured that everyone made it safely to the top. From here the path levelled, meandering through pleasant little valleys and over coarse rocky ridges before descending into the cloud and back into the heavy vegetation of the moorland. Soon, however, it climbed again, back into the rocky alpine zone. By mid afternoon we reached our bleak overnight stop, perched on a broad ridge with the mountain behind us and before us a sea of fluffy off white cloud, so close you felt you could step out on to it and walk across the skies of Africa. The next morning we headed out for Barafu Campsite, the trail was rocky and firm, with very little vegetation around, patches of snow still daubed the ground, though it was not cold. We traversed below glaciers and icefalls, high on the mountain above us, before dropping into the Karanga valley, a dry and desolate place. A final climb onto a sharp ridge and we were at Barafu or High Camp. We had arrived in the early afternoon, and the camp was crowded, busy with porters shouting, guides giving instructions, tents being erected and weary trekkers stumbling through the rocky maze. One of our capacious dining tents. Our cook soon prepared a hearty lunch, and afterwards we had a briefing about the climb to the summit later that night. We were at 4600 metres, (15,092ft. ), and with 1295 metres, (4,250ft. ), to the summit the ascent would be taken very steadily, ‘pole pole’ as the African guides would say, (swahili for slowly slowly). This mantra, often repeated over the last seven days, would take on a real significance that night. New batteries in the head torches, plenty of snacks in the pockets, fleece base layers and down jackets, all were checked. Then we rested, ate a small dinner, and rested again, some tried to sleep, I busied myself ensuring everything and everyone was as ready as they could be. One of the women was ill, gastroenteritis, desperately bad luck, her chances of summiting gone. At 11.00pm we set off, a snake of light joining with the other lights making their way up the mountain. It soon became cold, and then the snow came. It fell on already icy, compressed snow, making the route slippery and difficult, the slow pace slowed again. Barafu camp had emptied itself of summiteers, and they were all heading up the same slippery path. We stopped regularly, to warm cold hands, take on a little fluid or food, and to re-assess our group. In the dark and snowy conditions it was hard to find everyone, I stayed towards the back looking out for stragglers, periodically meeting up with knots of familiar faces, huddled in the biting cold of the night. Another one of our colleagues had to return to camp, dizzy and with a blinding headache, and another with chest problems, given oxygen, they were sent back down accompanied by a guide. People were now coming down towards us, members of other groups who had not made it to the summit. Slowly we clawed forward, and slowly we got nearer to the summit, as dawn came and the snow stopped we could see the sun rising over Mawenzi, the third of the volcanic peaks that make up Kili. We were well over 5000 metres, and the thin air held much less oxygen at this altitude, we were gasping for breath, and then suddenly we were at Stella Point, the day grew lighter, and photographs of the triumphant climbers taken. The last stretch, though difficult in the thin air, was on much easier angled ground, and my attention was taken by the wonderful views of glaciers and the snowy crater rim. It did not seem long before we were stood at the summit, Uhuru peak, almost 10 hours after setting out. Lots of photographs were taken, and then I accompanied some of the team back down the mountain to Barafu camp, a relaxed decent. Much of the snow that fell the night before had melted in the mid morning sun, and lower down the patchy snow gave way to bare rock and scree, giving better purchase and allowing us the opportunity to try a bit of scree running, always good fun. We chatted happily in the thickening air as we approached the camp, and headed for the dining tent for well earned tea and biscuits. Slowly the others joined us, many with aching muscles and sore knees but all elated to have made it to the summit. After a late lunch we headed out to our overnight stop at Millennium camp, before continuing the next day to the park gate and the end of our adventure on Kilimanjaro. The summit photo, 5895 metres, (19,340ft. ), Uhuru peak. 21 of our 27 summiteers had made it to the top of Kilimanjaro, and in so doing they had raised more than $1.4 million for the King Hussein Cancer Centre, an astonishing effort. And I got to walk in the ‘Snows of Kilimanjaro’. Thank you to all our team for making my job so pleasant, and the wonderful guides and porters who climb this mountain every week. Next postHiking and Scrambling in Snowdonia, the land of the red dragon.